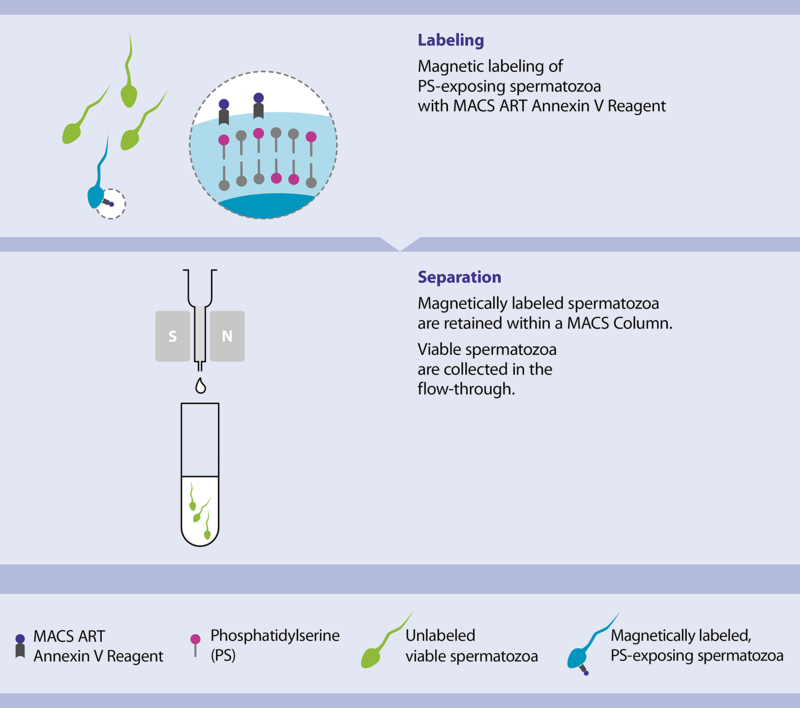 The depletion of apoptotic sperm cells begins with magnetic labeling of apoptotic sperm cells by the MACS ART Annexin V Reagent. The labeled sperm cells are then passed through a separation column located in a magnetic field. Unwanted sperm cells are selectively retained in the column. Non-apoptotic spermatozoa are not labeled by the reagent, so they pass through the column and are collected for any IVF application. Depletion of apoptotic spermatozoa using the MACS ART Annexin V System is simple and fast. It adapts easily into laboratories to enhance classical sperm parameters and lower sperm apoptotic markers. Additionally, it can be combined with other sperm preparation techniques for procedural flexibility. The depletion of apoptotic spermatozoa with the MACS ART Annexin V System is simple and fast.